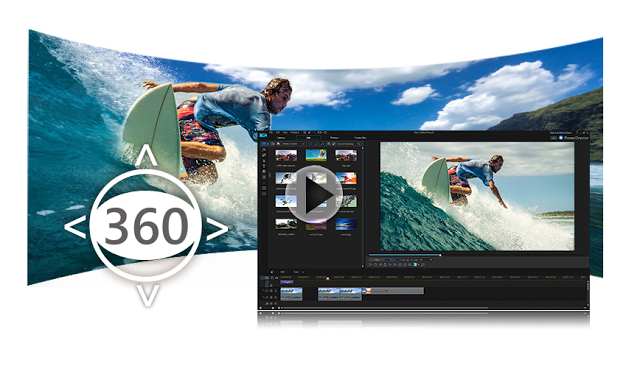 ​Cyberlink PowerDirector is one of the leading desktop video editors. PowerDirector 15 will be released tomorrow, and among other features, it will include 360 video editing capabilities, similar to those that are in the ActionDirector Gear 360 included with the Samsung Gear 360 (reviewed here). – Option to convert the 360 video to a regular 16:9 video for use with other non-360 videos, with the ability to pan the camera. Note that the title effects are relatively simple and will not warp the title based on where you position the title. Note also that I believe this software is for 360 videos that have already been stitched. I don’t think it can stitch footage from a multi-cam 360 rig. PowerDirector will be available on Amazon starting tomorrow for $99 (Windows 7, Windows 8, Windows 10).